Offered by us is a defect-less variety of glass boards (marker), which is available in various sizes and shapes. These glass boards are known for their glossy surface, robust construction and durability. Apart from this, the esteemed clients can avail these boards from us at the most competitive prices. 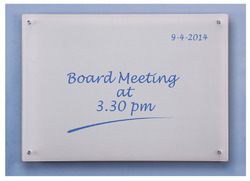 Glass Marker Writing Boards are gaining popularity over its conventional counterparts. Writing boards with glass are not only attractive to look at, but also score in terms of hassle-free maintenance. Glass boards are well-suited for use in offices and especially conference rooms. The use of two or more colored glass display boards makes the room look vivid and vibrant. Glass marker writing boards are safe to use as well since the lacquer applied to the back of the glass prevents it from damage and makes it more durable. Glass marker writing boards which have natural glass surface can write using a marker pen and it is wiped off with the duster. It can be directly installed on the wall very easily using studs. Looking for Glass Marker Board ?